TheaterJones reviews Jen Silverman's play The Moors. You don’t have to be a fan of the brilliant Brontë sisters to laugh your knickers off at Jen Silverman’s The Moors, fogging up the arena stage at Theatre Three, just in time for a potent autumnal dose of loaded lines and multi-function candlesticks. Still, it helps to at least have read Wuthering Heights, Emily’s brooding Gothic romance set in the desolate landscape surrounding the Brontë siblings’ home. Director Garret Storms sustains a delightfully spooky-tense atmosphere in which female imaginations go wildly savage in the confines of a lonely mansion in the English lowlands in the early 19th century. Moreover, the stifled desires and hissing threats familiar to Brontë readers all happen on Ian Loveall’s clever set design: a huge square of artificial turf cut through by parquet floors and plump Victorian furniture. Add a whip-sharp cast, outfitted in Aaron Patrick DeClerk’s richly textured period costumes, who elicit fear, trembling and helpless laughter, and you have a wonderfully witty spoof of repressed female libido gone hilariously perverse in 90 minutes flat. Silverman bites off bleeding chunks of the biography and literary style of Charlotte, Emily and Anne Brontë to celebrate and tease both their fiery, feminist independence and their ardent, famously romantic language. On Silverman’s acre of the moor, Emilie, a pretty governess (archly vamping Vanessa DeSilvio) enters the mansion’s sinister female subculture on a windy night, where a lonely Mastiff (melancholy, poetic Thomas Ward in country tweeds) lies beside the hearth. Haughty spinster Agatha (a steely, comically butch Emily Scott Banks) is all over her chronically confused little sister Huldey (a pliant, comically twitchy Mikaela Krantz) for her awful hair-do. That’s what sisters are for, right? Inscrutable Agatha instantly consumes inquisitive Emilie with her eyes, and then tells the young girl that the dog “will devour your face.” Fair warning. Los Angeles Review of Books features Octavio Solis’s Retablos. What authors, or books have influenced you? My favorite writers are JRR Tolkien, Charles Dickens, Sir Arthur Conan Doyle, the Brontë sisters, whoever wrote Beowulf, C.S. Lewis, Jane Austen, to name a few. I love Tolkien and Dickens’ descriptive language and the way they paint a scene and make you feel like you’re there, which I try to learn from; all Sherlock Holmes stories are delightfully atmospheric and thrillling; the Brontë sisters are so brooding and deeply-emotional, yet well-structured; Jane Austen is simply too much fun; C.S. Lewis has knife-edge logic and sees so clearly. I try to learn from these masters and implement these things into my own work. El Comercio (Perú) includes Wuthering Heights on a list of literary love stories adapted to the big screen. 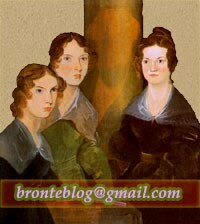 Finally, a warm welcome to the Brontë blogosphere to the Italian section of the Brontë Society.